Florida Villa Days is luxury 4 bedroom, 3 bathroom villa with an open plan design which has been upgraded in November 2017.. We have been owners for the last decade and maintain the villa to high standard, we not only see the villa as a rental property but as our home in the sun. We therefore take great care in the small details that make a house a home. We have our kitchen granite worktops along with a new family bathroom, new carpets, matresses and sofa's. The villa benefits from high speed wifi throughout including the pool deck area which is free of charge to our guests. Our beautiful villa has the major advantage of being southwest facing so the sun is on the pool/spa area all day. The outlook from the pool area is onto conservation land so there are no rear neighbours and we have privacy hedges either side. The luxurious master bedroom has a king sized bed and enjoys its own walk in closet with ample of storage for your vacation. The spacious ensuite includes his and hers sinks, walk in shower and a soak tub with separate toilet which also has access to the pool deck. Queen bedroom has a flat screen TV and its own ensuite with walk in shower and toilet. We have 2 twin beaded rooms, one is Mickey themed and both share a the newly refurbished family bathroom with a bath and shower. Each room has its own closet and flat screened TV..
We have an open plan lounge, kitchen dining area which is ideal family vacation living. Meals can be enjoyed at the granite breakfast bar or either formal or kitchen dining table. There is a large flat screen TV and a family wii for all to enjoy. Please note that for everyone's benefit, we have decided to make this a non-smoking villa with no pets allowed and we have A keyless entry system (no stopping to pick up keys). 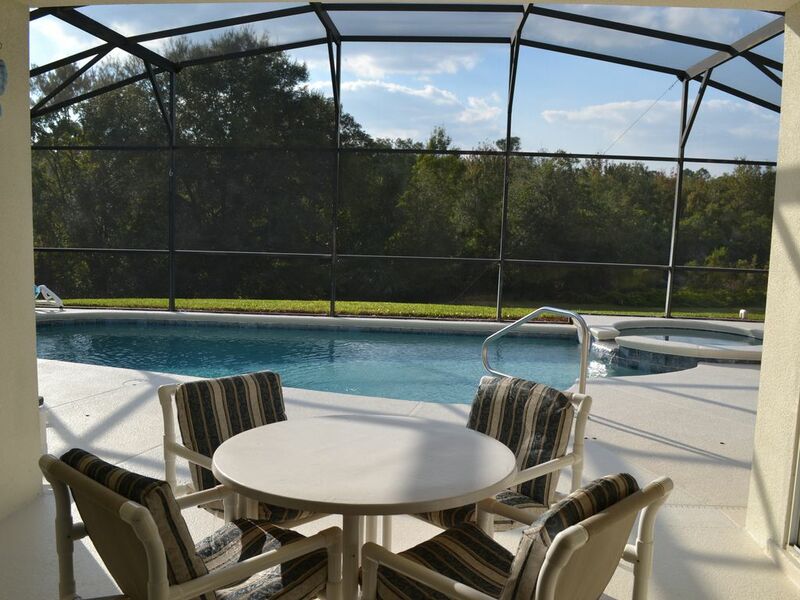 Keywords: Villa, Disney, holiday, vacation, family, romantic, fun, sunshine, south facing, pool, spa, private, luxury, orlando, mickey mouse, disney themed room, 4 bedroom, 3 bathroom, gated community, close to Disney, dining near by, resort shop, heated pool. Our names are Amanda and Euan we have two wonderful children. We all enjoy coming to Florida making the most of the sunshine, parks, shopping and dining. We have spent many a happy hour around the pool with our kids. We have owned the villa for over a decade and visit at least twice a year with family and friends, this is our home away from home. The Windsor Palms Resort is in a great location for the Disney attractions and our villa is one of the very few 4 beds that have a south facing pool and conservation view. We have privacy hedges either side which makes for a lovely peaceful place to relax after the hustle and bustle of the parks. Firstly sun on the pool all day with no rear neighbours!! Conservation view with all the wild life gives wonderful tranquility. We often see the balloons in the morning over the pool area. Easy shopping at the Outlets means we get great bargins. It is hard to beat some of the wonderful restaurants close by. dining is very close by. In ground heated spa with views of evening sunsets. Cable TV In Living Area & All Bedrooms, Travel Crib, High Chair, Hair Dryers, Iron, Coffee Maker, Games room including table football and table tennis. Thanks We enjoyed our stay! Extra trash bag and laundry soap could help with your with your instructions to contain trash and start laundry at check out. It was a great experience. The house and the facilities were excellent and Amanda was great. We had a great time. Everything was as advertised and the house and pool were in excellent condition. We had everything we needed to have a great stay. Amanda was wonderful to deal with and we would recommend this property and we are already booked to stay there next year. Excellent location and very clean and updated villa. Spent 5 nights in this lovely villa. It was very clean and was the perfect size for 4 adults and 3 children. The heated pool and hot tub was enjoyed by all! It was about a 10 minute drive to magic kingdom. Restaurants and markets were within 2 miles. We would definitely stay again. The owner, Amanda, was also very nice to accommodate a late check out! This house we stayed in was just right. We had a few issues with our stay and with the holiday it took an extra day to resolve. However nothing that ruined our trip and the owner was very responsive and pleasant and took care of the issues. We enjoyed the house and had a great trip. The house is lovely and being on a resort has access to additional facilities. You can make a request to view a film in the cinema from a list which is quite cool. Easy access to supermarkets. We didn't do Disney but its close to both Disney and Universal. I would say you really need a car albeit I think it does mention you can catch a bus. We ate at the Black Angus Steakhouse nearby which was amazing. Also be aware of Florida Toll roads as for some you need change and if you don't have change you need to get a postal order and then a stamp which is a bit of a pain! The house was spotless and had everything we needed. A massive plus was the huge washing machine and dryer so we brought home mainly clean clothes. Very easy process to gain access to the property and a quiet area for peace and relaxation. Would visit again and Amanda has been very helpful with any queries. Thank you for your kind comments on the villa. We do try very hard to maintain the villa to a high standard and provide a home from home experience. We are at the villa very soon to do more upgrades! We are delighted that you enjoyed the villa and look forward to welcoming your family back if you are lucky enough to visit the area again. Such a lovely, well decorated villa. We felt right at home from the moment we arrived. The pool had also just been resurfaced before we came; you can tell the owners take pride in their villa as it is upkept to the highest standards. Pictures honestly cannot do it enough justice. It was such a treat to stay here. The gated community is nice and quiet, it’s so relaxing to lay by the pool all day. The mesh screen does a great job keeping the creepy crawlies out so was lucky not to have been bitten so much on this trip. There’s an open grassed area, albeit on a hill, at the back which is great for games or a little run around with the family. It’s so close to the Disney and Universal parks, about a 20 min drive, and only about a 5 min drive to go the local grocery stores. The clubhouse does have some of the essentials to buy, and you can benefit from all of their facilities too, should you wish to swim in a bigger pool, use the gym, or watch a movie in the theatre. The staff are also incredibly friendly. Such a nice little community here. Would recommend Amanda’s place to anyone, and will definitely be back in the future! Cinema, Barbecue Area, Children's Play Area, Volley Ball and Tennis are all on site. Disney Theme Parks, Universal Studios and Seaworld are all close by. All the Disney parks are close enough to come home after the parades have a rest recharge your batteries in the pool and go back in the evening for fun and fireworks. , Outlet shopping is close by for all those bargins and great restaurants such as Longhorn, Bahama Breeze and Oliver Garden are very close by.